Named one of OPRAH'S Favorite things ~ Not just a shower, it's an experience! SHOWER, BATHE, EXFOLIATE, double-helping of shower possibilities - all with the delightful relaxing scent of Lavender and Meyer Lemon! Reinvent your showering experience! Exfoliate, purify, massage, and hydrate your skin while you bathe with the convenient all-in-one Spongeables Soapy Sponge. Spongelle is a revolutionary new technology combining the exquisite fragrances with time release lather. The body wash infused sponge exfolitates, purifies, massages and hydrates. Olive oil and botanical extracts will make your skin glow and your face smile. 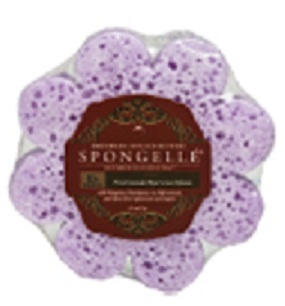 Spongeables Shower-Gel-in-a-Sponge is a hypoallergenic, anti-microbial sponge filled with fragrant, skin-rejuvenating shower gel that gives you a fragrant, bubbly spa experience every time you shower or bathe.